by Father Mitch Pacwa, SJ. Our Sunday Visitor (Huntington, Indiana, 2017). In the 50-plus years since the publication of the Second Vatican Council’s Dogmatic Constitution on Divine Revelation (“Dei Verbum,” Nov. 18, 1965), Scripture has become a more prominent part of Catholic life, and more Catholics pray with Scripture and participate in parish Bible study programs. But it’s probably fair to say that there is still plenty of room for improvement in this regard. A book such as this one is welcome, especially because it is designed for both individual and group use. You don’t need to join a Bible study class to benefit from this book; you can go through it on your own. If some approaches to Bible study, particularly in groups, have a weakness, it’s the tendency to have everyone read a scriptural passage and then simply invite each participant to share with the group what he or she thinks that passage means with no input from a resource with some scholarly and/or ecclesial authority. Father Pacwa’s book provides this kind of input because he has academic credentials to support his commentaries. Additionally, he writes with a lively style. Each session includes quotations and other insights from various Catholic sources. At the same time, Father Pacwa gives participants using the book numerous opportunities to share their own reflections and insights. 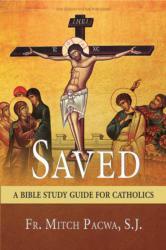 Regardless, however, “Saved” is a fine Bible study resource and one that deserves a high recommendation. Finley is the author of more than 30 books on Catholic themes, including “What Faith is Not” (Sheed & Ward) and an updated edition of “The Rosary Handbook: A Guide for Newcomers, Old-Timers, and Those In Between” (Word Among Us Press).